Looking for a luxurious five-bedroom holiday villa that offers the quiet and peacefulness of the countryside and a lively cosmopolitan resort just on your doorstep. Looking for a luxurious five-bedroom holiday villa that offers the quiet and peacefulness of the countryside and a lively cosmopolitan resort just on your doorstep? We're pleased to tell you that such a place does exist. 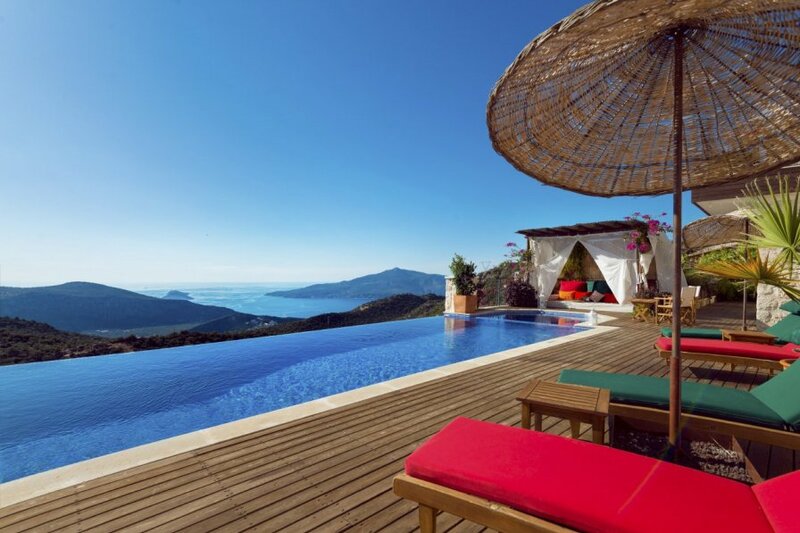 Say hello to stunning Villa Gol Manzara on Turkey's southern Turquoise coast. This group-friendly villa is nestled into the hillside, boasting magnificent views of sweeping Kalkan Bay and the traditional village of Ordu, and is within easy access of bohemian Kalkan town. The vast living area opens onto a stone terrace where you can enjoy your morning coffee overlooking the pool or pre-dinner drinks before the trip to Kalkan to indulge in delicious Turkish cuisine and low-key nightlife. With cushioned sun loungers lining the pool, deep-sit chairs you can sink into and a chic thatched-style pergola with romantic floor cushions and drapey voile curtains, you aren't short of scenic places to relax in the shade or bask in the Mediterranean sun. Continuing the decadence upstairs, the five bedrooms are all equally seductive and serene with contemporary light-coloured furnishings, and floor-to-ceiling windows and doors make the most of the spellbinding scenery and letting in the lovely natural light. Decorative touches like intricately-patterned sink bowls, soft cushions and potted plants and flowers complete the ‘luxe' aesthetic. Turkey's stunning Turquoise Coast and the centre of Kalkan, this villa is perfect for exploring the timeless beauty of ancient Lycia's pine-clad shores. There's a treasure trove of narrow streets, whitewashed Ottoman-Greek houses and inviting bazaars and boutiques, all waiting for you to discover – just say when. Villa Gol Manzara is quietly hidden in the rural hills, overlooking beautiful Kalkan Bay and the traditional village of Ordu on Turkey's famous Turquoise Coast. This beautiful spot near the centre of Kalkan has a majestic backdrop of the tree-lined Taurus Mountains and is well-known for its Instagram-worthy winding streets lined with pretty cube-shaped whitewashed houses. Once a small finishing village turned popular holiday resort, Kalkan still retains its authentic old-world charm and isn't as busy as other Turkish resorts. The town centre has an exquisite harbour, dotted with wooden fishing boats and is bordered with waterfront restaurants serving a variety of delicious food. You'll also find traditional bazaars selling everything from handmade rugs to fresh local produce, as well as a sandy beach, where the historic old town extends back from the sea. By night, the stars add a lyrical, fairy-tale-like quality to Kalkan – you can enjoy them over a cocktail on one of the rooftop bars or from the villa's own sea-facing terrace.